Two more horses have tested positive for morphine, the British Horseracing Authority has revealed. 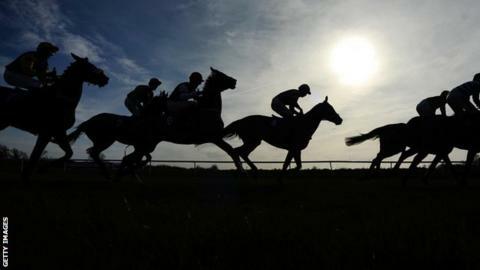 A horse feed specialist had already begun an investigation after five racehorses, including the Queen's mare Estimate, failed post-race samples - thought to be from consuming contaminated food. British firm Dodson & Horrell stopped short of admitting liability. But it is investigating with a supplier over the Alfalfa Oil Plus product. In a further statement on Thursday, the BHA said it is "continuing to investigate any link between the individual cases". Northamptonshire-based company Dodson & Horrell said in a statement: "Preliminary investigations suggest that any contamination of this component product did not occur at Dodson & Horrell's site. "The investigation is currently centring on Dodson & Horrell's supplier." Five horses originally tested positive, but it was announced on Thursday that another two post-race samples obtained from recent race meetings have been found to have morphine present in them. The two trainers of the latest horses involved have been informed of the BHA's findings. Buckingham Palace has indicated the positive test of Estimate, the 2013 Royal Ascot Gold Cup winner and runner-up in the 2014 race last month, was caused by contaminated feed. Oxfordshire trainer Eve Johnson Houghton has revealed one of her horses, Charlie Wells, is among the seven that failed tests. The three-year-old gelding tested positive after winning at Chepstow on 23 June, and has since been placed in two other races. The Didcot handler said: "I don't know which bit of feed it's in, but hopefully we'll get to the bottom of it, and hopefully it's a one-off." Dodson & Horrell, which was granted a royal warrant in 1985 to supply feed for the Queen's horses, says it has recalled some batches of the Alfalfa Oil Plus product as a precaution. "No positive test results have been recorded in any other Dodson & Horrell product currently in the market," the company added. "From information currently available to us it appears that any contamination may have come from poppy seeds that occur naturally in the environment. Please note this does not affect the welfare of the animal." Morphine is listed as a naturally occurring substance by the BHA. Its use is permitted out of competition but not on racedays. It is thought Estimate tested positive after finishing second in the Gold Cup at Royal Ascot in June. Trainer Sir Michael Stoute is unlikely to face any action, although Estimate could be stripped of second place. Disqualification would lead to the forfeiture of the £80,625 prize money for finishing runner-up to Leading Light.